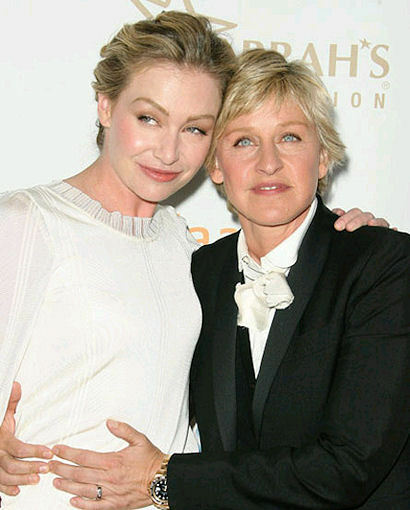 Pastor Prays To Turn Ellen Straight. How's That Working Out? Oh gosh. This video clip from Right Wing Watch pretty much speaks for itself. Pastor Lou Engle, while on stage at one of those mega churches or bath houses or clubs or whatever the heck Ramp is, leads his flock in a mass prayer to exorcise the homosexuality right out of the world’s Queen Lesbian. Oh wait, the position is already taken. “Come on Ellen Degeneres! Let her get converted…Pray for her salvation. Mighty conversions, she begins to preach, ‘Oh how my life has been changed! '” Riiiiiight. For what it’s worth, Engle seems popular with the kids. After this attempt at mega conversion, I can only assume that somewhere in Burbank, California, Ellen yawned and then went home to make love to her super hot wife, Portia. Nice work, Pastor! Check out the insanity on display below.